Actor Alex Skuby was born in Neptune, New Jersey. He moved to Chicago in 1992 and was cast in various plays with several different theater companies. In 1998 Alex moved to LA and has been in television series, films and voice-overs. Some of his credits: "Santa Clarita Diet," "Bones," "Last Man Standing." "CSI," CBS's hit sitcom "The King of Queens" (5 seasons recurring as ‘Mr. 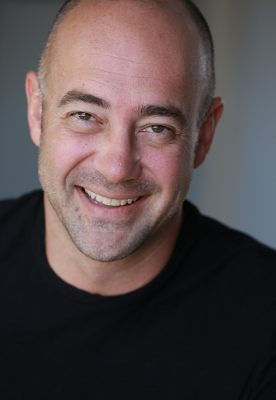 Pruzan’), recently recurring on Freeform's drama series "The Fosters" as Detective Joe Gray. We caught up with him in rehearsal for the new play Damaged Furniture opening Saturday March 24 and running Saturdays only at the Whitefire Theatre. How did you get into acting? Did you grow up in a creative or artistic family? My mother had a beautiful voice. She sang all the time around our house. My father is a salesman. He's always had a big personality. I would always try to get their attention by being, what they called, a "ham" - - putting on shows in the living room for them and anyone who'd care to watch. I’ve always had a yearning to be on a stage I guess. You are known for roles in the Freeform Drama Series “The Fosters” and the sitcom “King of Queens”; and work as a professional actor in both TV and film. Was there a particular role (in TV or film) that you consider your breakout role? And how did that lead to other work opportunities? Well, I started in the theater. The role I did that let me know that I indeed wanted to pursue this as a career was at a community college in New Jersey. I played Lt. Colonel Nathan Jessup in A Few Good Men. I was 19 and I remember being in that show and feeling a sense of wholeness… in a spiritual way. Then when I moved to Chicago to attend the DePaul Theater School, I was in hog heaven. Theater in Chicago is amazing; very talented actors in that city. As far as TV and film goes, I'd have to say "King of Queens". It validated all the work I had put in over the years figuring out the craft, and was a very fun job. You were in the original cast of Howard Skora’s well received Miserable with an Ocean View which played for months of Saturday nights at the Whitefire Theatre in 2015. What was that experience like for you? Absolutely loved it. The cast was great. The director was great. The script was wonderful. I was incredibly grateful to do that show. How did you get involved with the production of Howard Skora’s new comedy Damaged Furniture? Howie told me about the new play he had written right before Christmas. He mentioned that he had me in mind to play the lead role of Doug Elling. I was immediately excited. Howie is an amazing playwright. In addition, Jim Fall was going to direct - he directed Howie's last play. I love working with Jim. By the way, the cast of this play is wonderful! Before Miserable with an Ocean View, I hadn't done a play in about 17 years. That saddened me, especially since it's where I started. You can get sucked into the "business" side of acting when you come to LA. When you begin getting nice pay checks from acting in front of a camera, the thought of doing theater can slip away. For me it kind of did. I remember waking up one day and saying to myself "I need to do a damn play again! Get back to the rawness of craft!" Theater is definitely raw. No safety nets. I absolutely love it. It frightens me. What is about your character you hope to communicate? How did you and your wife, Mo Collins, meet? This is the first time you’ve worked on a play together. What’s that been like? We actually met online. We fell in love through instant messaging. Yeah, this is the first play we've done together. We've been on stage together before - but not in a play. It’s EXCITING! She's soooooo funny and talented. Truly awesome actress and human. It was a bit strange when I found out she was playing my aunt. Hahahahaha... But when I was assured it wasn't a "blood" relative, I was ok with it. I have a comedy movie coming out next year called "My Babysitter the Superhero" ... My wife is in that too. Very fun shoot on that. I play an evil alien warlord named Commander Kruel. Should be fun for the whole family!